You know I love me some inexpensive crafts activities. Well, hold on to your wallets because today’s is a good one! I happened to have all the supplies already. If you are missing some, a quick trip to your local dollar store will remedy that. 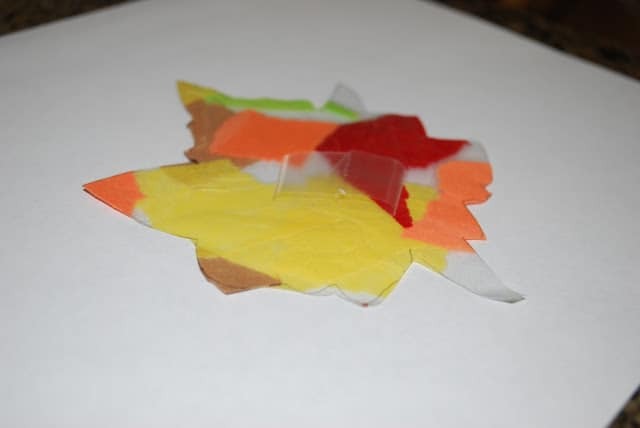 Today we will be making a Fall tree with suncatcher leaves. 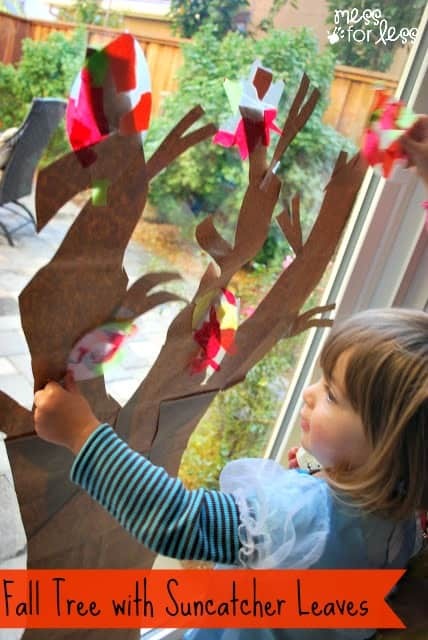 For more fall tree ideas, you can try Painting a Q Tip Fall Tree or a Fall Fingerprint Tree. 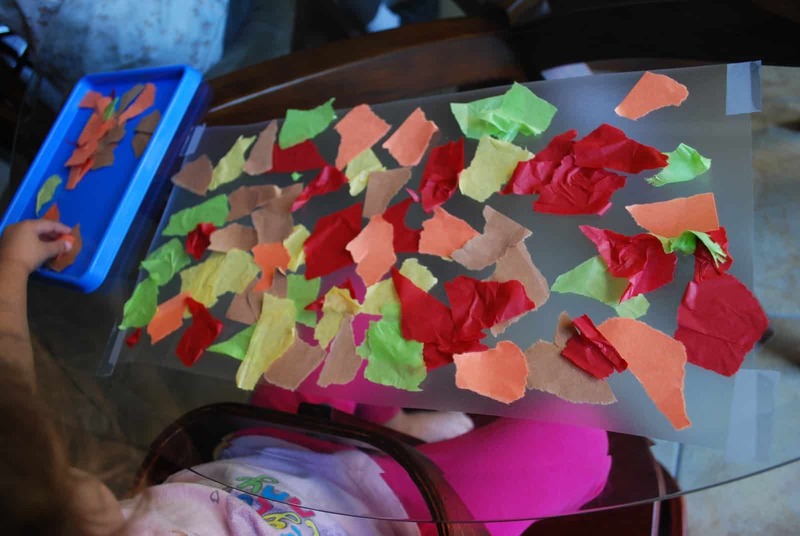 I think this activity would work great using only tissue paper, but I did not have brown tissue paper and didn’t want to buy some just for this craft. 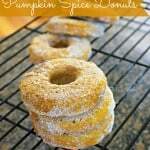 So I used brown construction paper and it worked well. Use what you have is my motto. 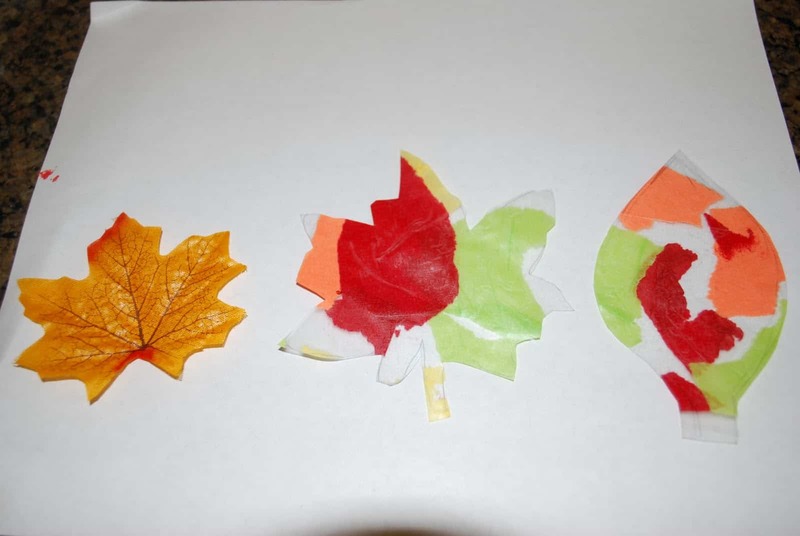 You will want to tear your Fall colored paper into small pieces between 1-2 inches long. No need to be precise here. 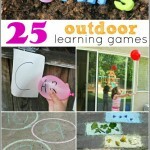 If you have older kids this would be a great thing for them to do. Most kids love tearing paper and it’s a good activity for developing hand strength. 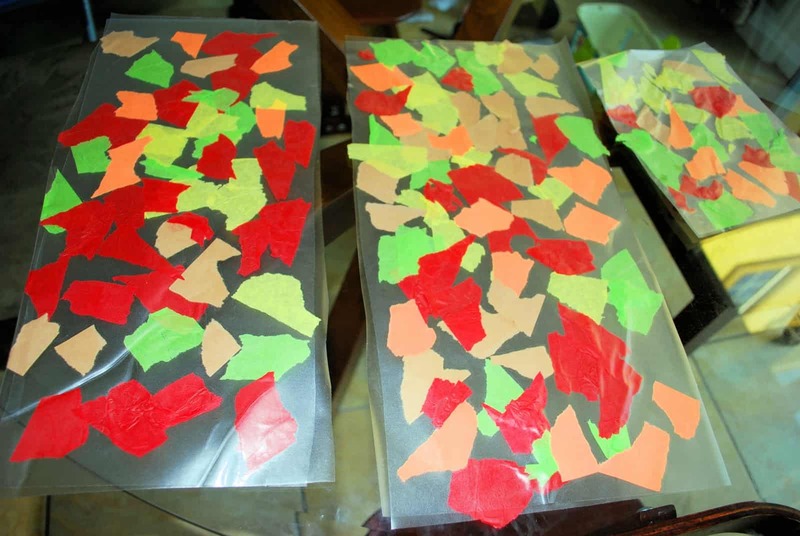 Next you will take a length of contact paper, peel it away from the backing, and tape it to the table. The length of contact paper you use will depend on your surface. 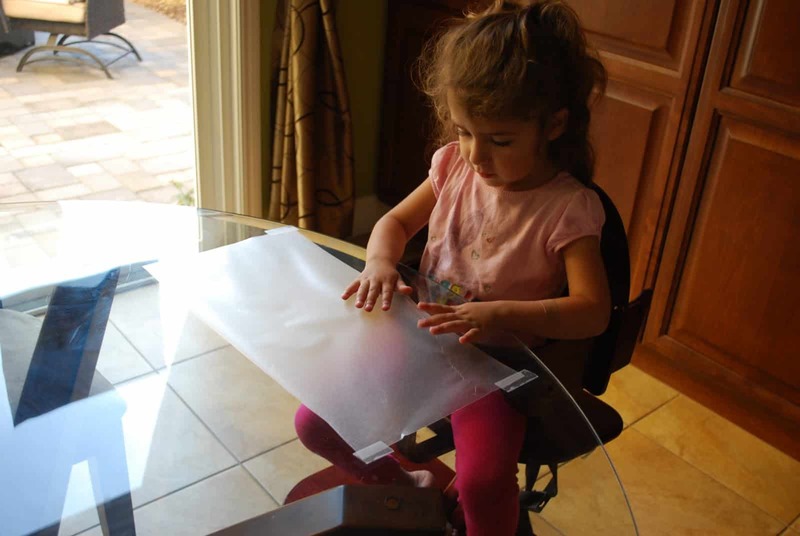 For one of my twins I used a long sheet of contact paper because she had a big work space. My youngest did the activity in her high chair, so she had a smaller piece of paper. You will be cutting leaves from this contact paper later, so make sure you have enough to trace a good number of leaves. 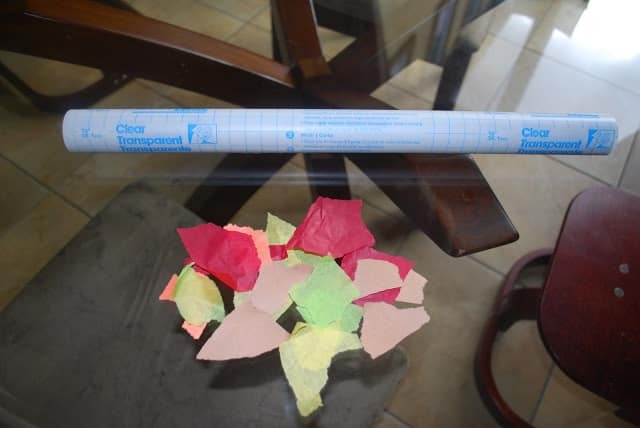 Next, have your child cover the entire sheet of contact paper with the torn tissue paper. When they have finished this step, you will take over. Cut another piece of contact paper that will fit over the first, and stick it on so the torn paper is sandwiched in between. Next, you will want to use a large paper bag. 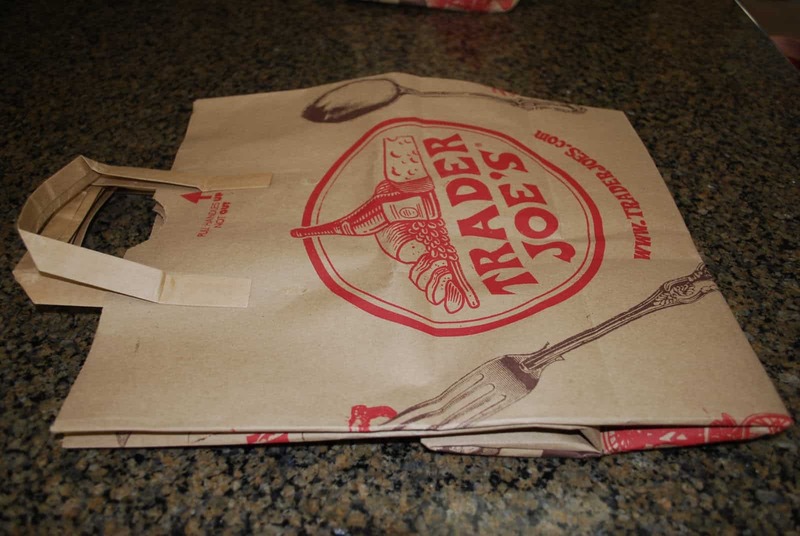 I found a Trader Joe’s bag works well, but what’s my motto? That’s right, use what you have! You guys have been paying attention. 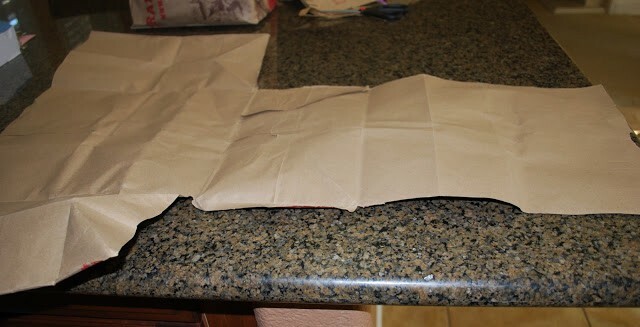 Cut off the handles and cut open the bag so it looks like this. Now comes the trickiest part for me. 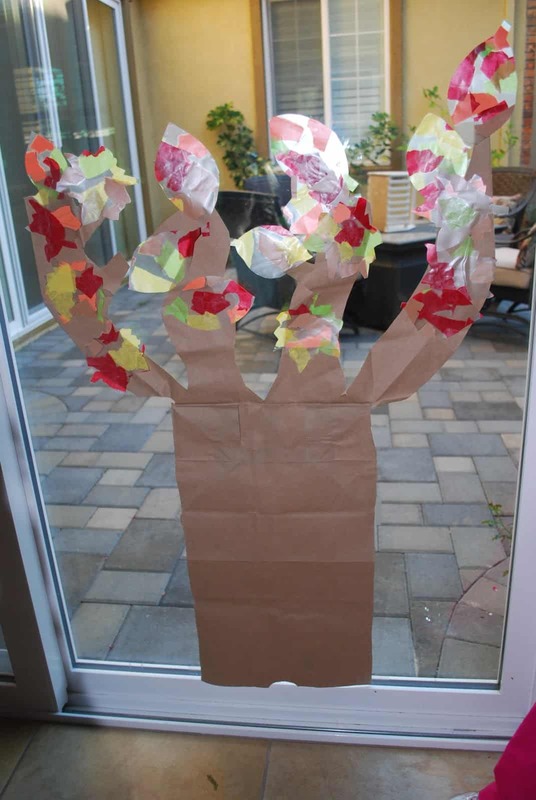 Draw and cut out a tree. I must confess, drawing is not my thing. The first tree I made for this project looked like a Menorah. Really. I’ll share at the end. Hubby helped me fix the tree so it looks less like a Menorah. 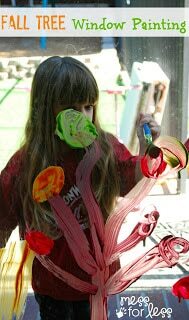 Remember those sheets of pretty contact paper the kids made? Now you will be cutting leaves out of that. Being that I can’t draw, I used a template of a leaf to trace the one below that looks like a maple leaf. I was able to freehand the light bulb looking leaf using a marker. 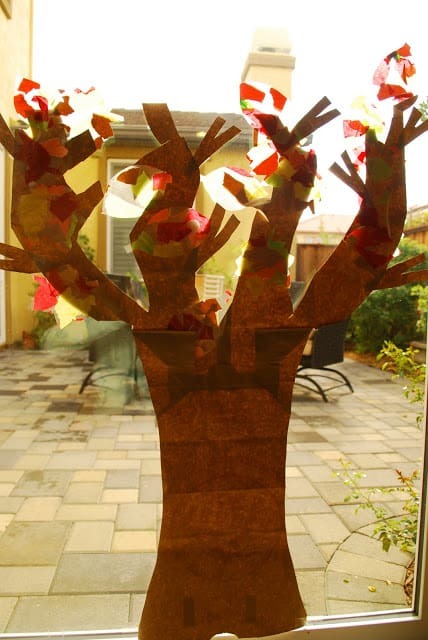 Cut out as many leaves as you can from your contact paper. Now you can involve the kids again. 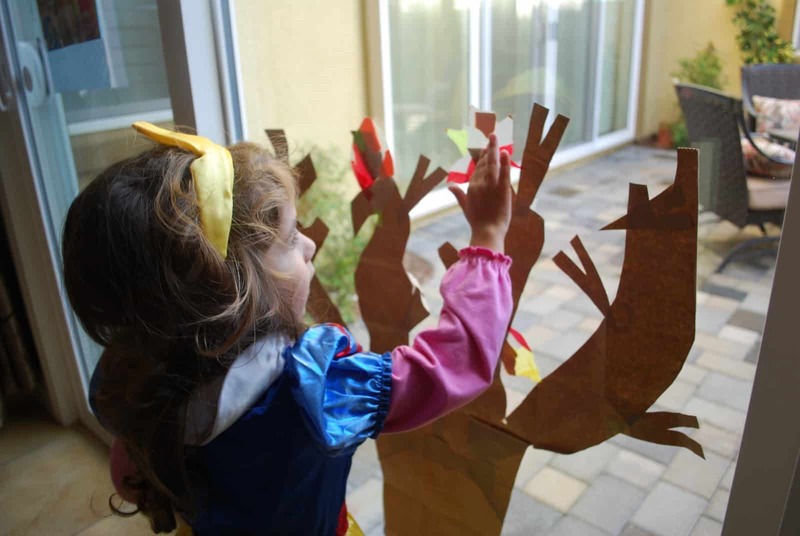 Put some tape on the back of the leaves and let the kids hang them on the tree. My kids loved doing this so much that at various times over the past few days, I have removed all the leaves so they could stick them back on the tree. Finally, you will be left with a pretty Fall tree. Or if you you are me, possibly a Menorah. See? I am grateful to my wonderful husband who is not only my blogging tech support, but my tree fixer. Here is his improved tree. um…I LOVE this!!!! what a super cute fun idea!!! This is the second use for contact paper I have seen today! Which I already put on my list to buy but now I see more reason to buy! Thanks for visiting me and following…I'm now following back. 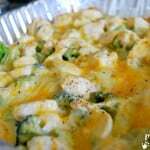 I can't wait to read your How To Grocery Shop tips! I'm always looking for tips to save money! 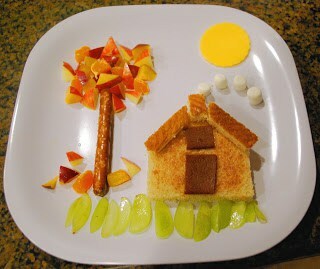 What a cute crafting idea for the kiddos. Babies, Thanks for the visit! Artsy_Momma, Yes, it's quite big. Maybe as the kids get bigger I'll make it even taller. Your leaves are beautiful!! I love them. Nothing like sun catchers and Autumn colours! This is lovely, i love the idea of sticking an entire tree on the patio door.